The Kingdom of Aksum was an ancient kingdom of Africa. It is sometimes called the Kingdom of Axum or Ancient Ethiopia. 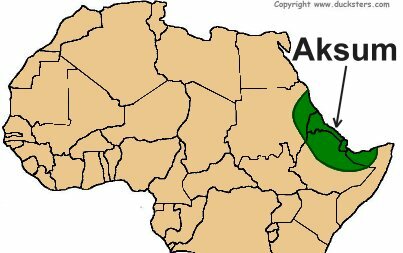 Where was the Kingdom of Aksum located? The Kingdom of Aksum was located along the southern coast of the Red Sea. While most of the empire was west of the Red Sea in the Horn of Africa, at times Aksum also held portions of the Arabian Peninsula to the east of the Red Sea. The kingdom covered much of the current day country of Eritrea as well as northern Ethiopia, Sudan, Yemen, and southern Saudi Arabia. How long did the Kingdom of Aksum rule? The city of Aksum likely formed around 400 BCE. Legend has it that the kingdom was first established by the son of King Solomon of Israel and the Queen of Sheba. Aksum began to rise in power and expand around 100 CE, reaching its peak around 350 CE. It continued to rule the region until around 940 CE when it was conquered by a foreign queen. After a period of unrest, the Zagwe Dynasty took control of the region. Aksum reached its peak under the leadership of King Ezana who ruled from around 325 CE to 360 CE. During this time, Aksum expanded its territory and became a major trade center. It was under King Ezana that Aksum conquered the Kingdom of Kush, destroying the city of Meroe. King Ezana also converted to Christianity. He was a devout Christian and Christianity became the major religion of the kingdom. Aksum was perfectly located to become a major center of trade. Merchants would travel from central Africa, Persia, India, and Egypt bringing their goods to Aksum to trade. Aksum had access to several different trade routes including major waterways such as the Red Sea, the Gulf of Aden, and the Nile River. The major port city of Aksum was the city of Adulis, which was situated on the coast of the Red Sea. Merchants in Adulis traded in a wide variety of products including salt, gold, ivory, gems, cloth, glass, and olive oil. Some traders would travel from distant lands such as the Roman Empire and India to acquire goods at Adulis. Because of Aksum's location and role in international trading, the culture of Aksum became a blend of many cultures throughout the region. They were influenced by the Egyptians, the Greeks, the Romans, and the Arabs. Christianity, the primary religion after 325 CE, had a major influence on the culture as well. Aksum was one of the more advanced cultures of Ancient Africa. They developed a written language and minted their own coins. They also developed terraced farming and irrigation, which allowed them to farm the slopes of the local mountains, making their hilly land more productive. The city of Axum still exists in northern Ethiopia. It is a fairly small city with a population of just over 50,000 people. It is one of the oldest continuously inhabited cities in Africa. The stone buildings in Aksum were built without the use of mortar. Instead, the stones were carved to fit snugly together. The city of Adulis was destroyed by Islamic invaders in 710. 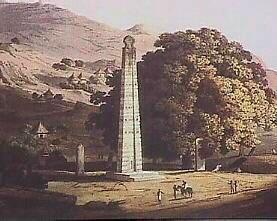 This isolated Aksum and began its decline. With merchants from all around the world coming to Aksum to trade, Greek was generally used as the common language.